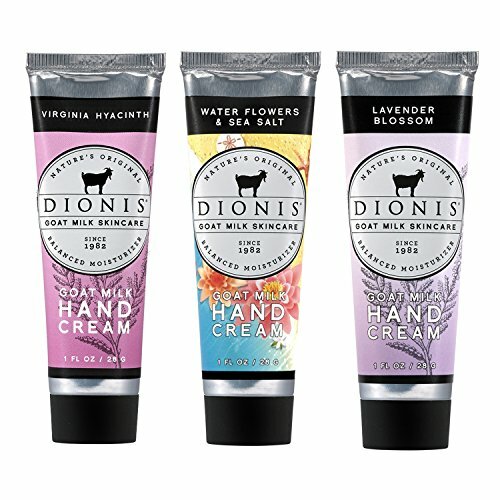 Dionis Goat Milk Hand Cream 3 Piece Travel Gift Set - Virginia Hyacinth, Water Flowers & Sea Salt and Lavender Blossom by Dionis at Toronto Free Flight. MPN: 3 PC HC VHWFSSLB. Hurry! Limited time offer. Offer valid only while supplies last. Our vitamin rich, non-greasy formula absorbs quickly and completely for lasting protection. Use it on hands, body or wherever dry skin occurs . . .
Three item set that includes three 1 oz tubes of Goat Milk Hand Creams in Virginia Hyacinth, Water Flowers & Sea Salt, and Lavender Blossom. Fragrance Descriptions: Virginia Hyacinth Hand Cream is nostalgic to the brands roots in the highlands of Virginia. Water Flowers & Sea Salt has heart of water lily, lotus and magnolia dew complemented by fresh melon, rosewater and musk, with a kiss of sea salt. Lavender Blossom is a delightful Aurelian lily blossom, juicy orange and casis surrounded by jasmine, rose and lavender on a creamy background of coconut, apricot, nectar and musk. This travel collection has great scents. Also drop one in your handbag, at the office and a drawer in your kitchen. If you have any questions about this product by Dionis, contact us by completing and submitting the form below. If you are looking for a specif part number, please include it with your message.